The Application Developers Alliance is an industry association dedicated to meeting the unique needs of application developers as creators, innovators, and entrepreneurs. Alliance members include more than 30,000 individual application developers and more than 150 companies. The Apps Alliance aims to be the rising tide of the industry, to deliver essential resources, serve as a collective voice on policy issues, and act at the connective tissue in the app ecosystem. 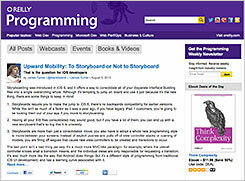 HTML5 Weekly is a free, once-weekly e-mail round-up of HTML5 and browser technology news and links. It covers CSS3, Canvas, WebSockets, WebGL, Native Client, and more. It has 45,000 subscribers.